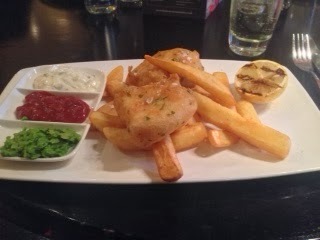 I ate: Cod and chips, £13- the fish came in a herb tempura batter, with chunky chips and half a griddled lemon, with small dishes of tartare sauce, ketchup and something else I can't remember on the side. My companions ate: Among the group there were orders of the burger, steak, fish pie and the vegetarian filo parcel. The food was: Excellent - this was a posh version of traditional British pub grub, cooked really well and presented beautifully too. The atmosphere/service was: It's a nice busy City atmosphere - not too noisy but not so upmarket that it's all hushed conversation. I did think the service was a little slow bearing in mind we wanted to get in and out on a lunchbreak, though perhaps that was due to us being a larger group. Price range/value for money: Pretty good - some main courses are more expensive, such as the fillet of beef at £25, but others, like the burger, are reasonable at £13. Some dishes come with sides but they are also available separately at an additional charge. Would I recommend it? Yes, it's slightly tucked away down a side street near Bank so away from the hustle and bustle of the City; in fact I worked in the area for a long time before I even knew it was there! There is a good selection of food and it straddles the line between casual and more upmarket dining.